Costco run for keto diet. Gabe and Bryan head over to a local Costco to stock up on some essentials for keto diet meal prepping. Follow them through the meat, produce, and dairy sections as Gabe explains what to look for and what to stay away from. Gabe mentions doing two servings which would be a total of six meat balls. Add some veggies and avocado and you have yourself a quick keto meal. One of the crucial things that you must look out for when shopping for keto, is the sugar contents. Some meats are marinated in high sugar level sauces which will spike the carb intake and can throw you out of ketosis. For the keto diet, it’s important to make sure you are getting your greens in with every meal. They guys go into the vegetable section next to check out some salad mixes. Here is where you have a little bit of freedom, whether you want pre-made salad kits or basic greens. The one thing that you must be cautious of when getting the pre-made kits is the dressing and topper packet. For example, the oriental salad kit has a ton of carbs if you use the dressing it comes with. So, you either what to go light or replace it with a lower carb dressing. The second thing to look out for is the toppings. The mix comes with a nut and raisin topping. Although the nuts are ok, the raisins are high in sugar and will not fit in the keto diet, so either remove the raisins or don’t use the toppings at all. Milk is another thing that isn’t “bad” for you but, when it comes to Keto, it doesn’t fit the diet. Regular milk has a high carb content, which would kick you out of ketosis. The alternative is almond milk. This is an almond based milk that is high in fat and low in calories and carbs. Almond milk plays a good part in high fat protein shakes, adding extra protein, fat, and great taste. Fruits are a healthy option, but when following keto, they are still against the diet. Fruits are high in fructose which is sugar. Although it’s a healthier sugar, it still translates to a carb and does not work within the diet. Most sauces are packed with sugars and carbs, but some of the keto friendly sauces are alfredo and organic pasta sauce. Both can be thrown over your meats and salads to add a little extra flavor and fat to your meals. Gabe explains that he uses the Kirkland egg whites to make his protein shakes. One carton will get you two shakes that sit roughly around 50g of protein. There are 6 cartons, so that’s 2 weeks’ worth of shakes. The only thing you’ll need to do is add your fats, greens and ice, and you’ll have your keto shake. If you are following the Genesis diet, it’s important to remember that phase 2 is just for one day, then back to phase 1. It’s also important to not go crazy on phase 2, as you can still throw off your diet if you consume to many carbs. If you struggle to find time to meal prep or even just want your meals made for you, Nutrition Solutions will take care of you. They are our recommended food prep company that the Body Spartan team uses. They will deliver as well, so if you plan on going on vacation, you can have your meals sent to your destination so that you can stay on top of your diet! Get started on a powerful 12- week fitness transformation program with the original keto diet, recipes, workouts, and more! It’s time to get started on your goals! 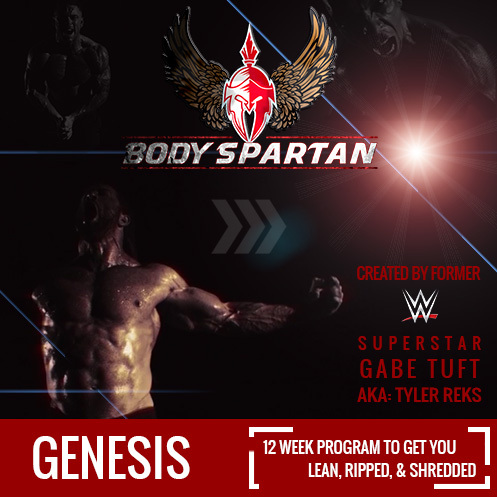 The Genesis Program has custom calculated keto-diet macros and a full nutrition plan. It also comes with recipes, a 12-week workout program, members area, supplement guide, and instructional videos. Great stuff Howard! I’m getting ready to get my food for the Genesis diet, this is very helpful!